Osnat Lubrani is the United Nations Development Coordinator and UNDP Resident Representative in Kosovo, having served in these posts since November 2009. She is responsible for the coordination of the activities of 20 UN agencies who in the aftermath of the 1999 conflict are dedicated to advancing a rights-based, sustainable human development agenda. 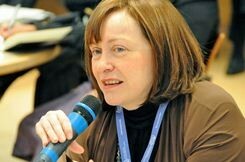 Ms Lubrani joined the UN in 1997 and formerly served in various positions at the UN Development Fund for Women (UNIFEM), including as Director of the Brussels Office responsible for relationship-building with European institutions, as well as the Regional Director for Central and Eastern Europe. She also served as the UDNP Deputy a.i. in Skopje during the 2000-2001 insurgency in the north-west of (FYR) Macedonia. Prior to joining the United Nations she was a producer and director of documentary films for international TV. Ms. Lubrani holds a Masters’ degree in International Affairs from Columbia University in New York, with specialization in Economic and Political Development and Human Rights. She holds a second Masters’ degree in Film and Television Production from New York University.